About half the final-salary pension schemes in the private sector will have closed to existing employees within the next three years, a survey suggests. Actuarial firm Watson Wyatt surveyed more than 250 employers, many of them large, in July about their intentions. While about 75% of all final-salary schemes are shut to new recruits, only about 9% are closed to current staff. But this year has seen a flurry of employers closing their pension schemes to all further contributions. Watson Wyatt said that if its prediction of many more closures was borne out, about one million people currently paying into a final-salary scheme would be forced to join an alternative pension plan by 2012. "When employers are cutting jobs and freezing pay, pension arrangements will inevitably be put under the microscope," said Rash Bhabra of Watson Wyatt. "At the same time, companies are confronting much bigger deficits. "These trends also get their own sense of momentum as companies benchmark themselves against their competitors," he added. Mr Bhabra said the number of pension schemes closing to existing staff could soon accelerate rapidly. With ballooning deficits putting pressure on the finances of both employers and pension schemes, there have been a number of high-profile closures announced or suggested this year. Among them have been Barclays, Dairy Crest, Fujitsu, IBM and Morrisons. The giant Royal Mail scheme is also under potential threat of closure because of its huge deficit. The overall situation has become worse because of falling share prices and the rising cost of paying for pensions in the future. According to the latest calculation by the Pension Protection Fund (PPF) the collective deficit of the UK's 7,400 private sector schemes currently stands at £158bn, compared with a deficit of just £19bn in July 2008. Last week, accountancy firm KPMG predicted that nearly a quarter of the biggest companies on the UK stock market would be unable to pay off their pension deficits from their spare cash. Watson Wyatt said that the number of schemes still open to new joiners would dwindle to just 2% by 2012. And most of those firms who expected keep their schemes open to current staff would make them less generous. "When defined-benefit schemes began to close to new entrants, existing members thought they would be unaffected as long as they stayed with the same employer," said Mr Bhabra. 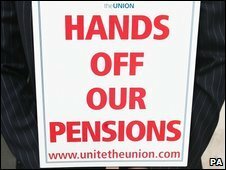 "Those still in defined-benefit schemes have been protected from the recent stock market downturn, but even they are now going to have to live in a world where it is not the employer's problem if the money that was put aside will not buy the pension it was supposed to," he added.